The first thing you need to learn is – What is affiliate marketing? 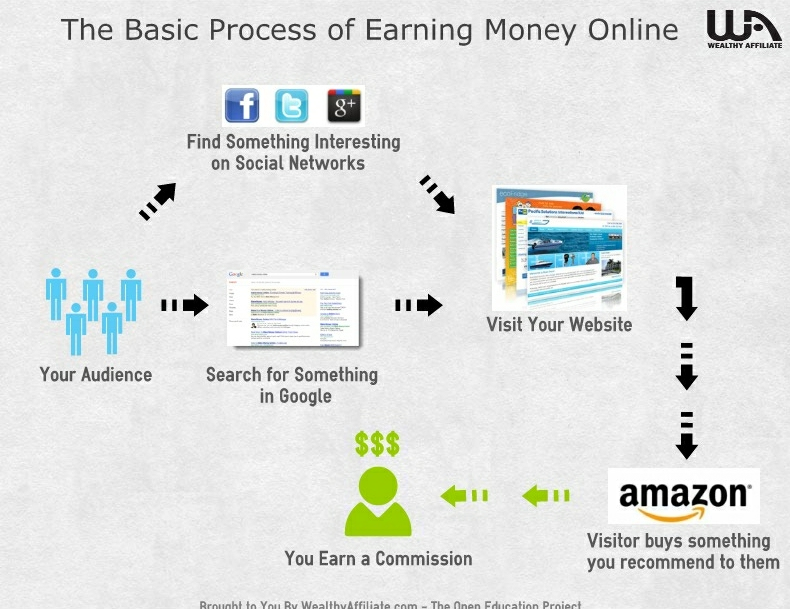 So you can understand how a affiliate marketer makes money online. Audience – the visitor who come to your website and click a link to the merchant because of your recommendation, or they see something they like. As you can see from the diagram above. To make money with affiliate marketing, first thing you do is to build a website. This website is your foundation for success, your audiences come to your website. When they click on the product you recommend and visit the merchant site. They buy something from the merchant and you get pay a commission. This is how you make money as a affiliate marketer. The merchant will take care of shipping of the product, billing and everything in between. It is very important for your website to appear on the first page of Google search. Don’t worry about it at the moment, I will teach you how to do that. You can still be an affiliate marketer without building any website. Building website is the best option, but if you don’t want to do that – there is another way. You just sign up with Amazon or other merchants. Then you can post your product banners or links on social networks, including Facebook, Google+, Tweeter, Instagram or Tsu. When people click through your banners or links, you will get your commission. The drawback of doing this is when you stop posting your links on social media, your business stop coming in. As compare to your website, which is on the internet 24/7 for the world to see. It takes time to build up your followers on the social network. I found it very time consuming posting and interacting with my friends and followers. You might have to set up a schedule. If you want your advertisement to appear 24/7, you can pay for advertising on social media. It will cost you money for the advertisement, you can try it out with some initial investment. H, please can you tell me how to begin the actual process of how to build my own website please? And then how to find the goods to sell and then how I should approach Amazon for example with my offer and finally how much do I need to pay Amazon and finally what do I need to write on my website to attract customers?